Major William Cage (Tom Cruise) works in the Media Relations department for the worldwide armed forces, tasked with defending mankind from the aliens, known as Mimics, who are attacking Earth. After a meeting with General Brigham (Brendan Gleeson), Cage is sent to the base at Heathrow, to be sent into battle, despite having no combat experience. When Cage awakens at Heathrow, he is greeted by Master Sergeant Farell (Bill Paxton), and forced to join the J-Squad unit. Told that Cage is a deserter, the J-Squad is not happy about him joining the unit, and is treated appropriately. The next morning, he is fitted with a weaponized suit that allows even minimally trained soldiers to become killing machines. As the unit is about to be dropped into the battle, the plane transporting them begins exploding. When they land on the beach, most of the armed force is slaughtered by the Mimic army. On the beach, Cage sees Rita (Emily Blunt), a world-renowned soldier, famous for her Mimic killing prowess. As Cage and the J-Squad are pinned down and being attacked by Mimics, a large Alpha Mimic barrels down on him. As he kills the Alpha, he is covered in the Mimic’s blood, which burns through him like acid. Cage awakens with a start back at the Heathrow base. Unsure of what just happened, he is confused when Master Sergeant Farell has the same conversation with him that started the day before. Cage and the J-Squad are dropped into the same battle the next morning with the same result. Cage dies during the battle again, only to awaken to Master Sergeant Farell at Heathrow forcing him to join the J-Squad. Every time Cage dies, the day is reset. Cage begins to memorize the battle allowing him to survive slightly longer each time. Rita recognizes Cage’s ability. With the help of Dr. Carter, now a mechanic who was once considered insane for trying to explain the Mimics’ time control capabilities to higher-ups, Rita and Cage must try to find the Omega, the “brain” of the Mimic army and destroy it to save mankind. Edge of Tomorrow is the type of big action movie that should have opened the summer blockbuster season. It is sharp, funny, and full of action. Director Doug Liman doesn’t waste any time getting into the action, either. And he does so in a way that doesn’t sacrifice story telling. You get just enough background to understand what is going on without wasting precious time getting you into the thick of it. Tom Cruise is the actor that everyone wants to hate. But there is little to hate about him in Edge of Tomorrow. He knows his way around an action movie. He is believable. And he delivers his lines, both the serious and the funny, with such conviction that he sells the character. Each time he awakes at Heathrow, he changes it up ever so slightly. It is just a moment, but each death brings a different awakening. It keeps the repetitive moment from feeling too repetitive. Emily Blunt is excellent, as well. While she may not have as many high-octane films under her belt as Cruise, she carries her character well. She knows what Cruise’s character has been through and is desperate to get his help so they can overcome their alien invaders. The special effects are spectacular. There is constant action in every scene, making this even more remarkable. Yet, there is not so much action that it becomes difficult to keep track and notice what is going on around the characters. The story is as believable as can be expected, given that it involves aliens attacking Earth and time travel. It never delves into the cheesy or completely unrealistic, as happens so often in these types of movies. My biggest complaint would have to be a minor one. Why the aliens are called Mimics is never explained. It leans towards other possible capabilities, but we are never given a glimpse into that side of the story. 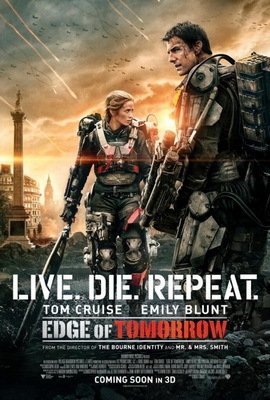 Edge of Tomorrow is a dystopian, war-torn version of Groundhog Day meets Independence Day. Forced to live the same day over and over, Cage, like Bill Murray’s Phil, learns how to make the best of the situation while trying to figure out how to break the loop. If you’re looking for the action movie to see this summer, Edge of Tomorrow is it.